The Derry Gardens, as they were known when Derry and Toms were still trading on Kensington High Street, have been the responsibility of many owners since Ralph Hancock proudly handed them over to Trevor Bowen, the Chairman of Barkers and Derry and Toms, in May 1938. Through the Blitz of World War Two, when the gardens took two direct hits from enemy bombers. Their glory days of the 1950s and 1960's and then into the wild and wonderful Biba era of the early 1970's, the gardens remained very much as they had been since that day with only a few minor alterations. After Barbara Hulanicki left 'Big Biba' in 1975, British Land Company decided that the building was worth more than keeping the Biba business running. The old Derry and Tom's store was divided into separate retail outlets. The roof garden became the property of Rama Superstores although it only received the minimal of attention. In 1976 the Royal Borough of Kensington and Chelsea Council placed a Tree Preservation Order on the trees growing in the gardens to ensure that unnecessary removal or harmful pruning works were not carried out. In 1978 the gardens became the subject of a redevelopment. The tea pavilion gave way to Regine’s restaurant and night club. New lifts were installed destroying the rear part of the garden and necessitating the removal of a bridge across the river. The cascades went too, their Pennsylvania rock was later used in a grotto feature by the new entrance to the roof gardens. The addition of a new air conditioning chiller unit also destroyed the line of the Spanish loggia walkway so that the long view through to the Tudor garden could no longer be seen without break. Terracotta pots, statues and gayly painted urns disappeared or were removed and lawns replaced the flower beds in the Spanish Garden. The viewing platforms, deemed unsafe, were closed. Even the circular windows, found in the Woodland garden were given wrought iron grates. The original planting schemes were lost to time and the gardens took on an altogether different feel. Over the intervening years, where previously a small army of gardeners had cared for the gardens, a single part-time and enthusiastic gardener took to looking after their well-being. The gardens continued to thrive, although root penetration from the maturing trees started to cause problems for the upper floor of the building. 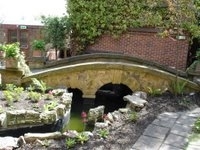 In 1981 the Virgin Group, headed by Sir Richard Branson, purchased the gardens. Regine’s was replaced by the Babylon Restaurant and a members-only night club. In 1986 the gardens were awarded "Grade II Star" listing by English Heritage. This meant that no work could be carried out without permission and then only under their supervision. Head Gardener, Vivienne Anderson, who took over the job of maintaining the gardens in 1987, was responsible for their £500,000 facelift. Work was completed in the Spring of 1992 and on 6 May that year, they reopened with a spectacular garden party attended by a number of celebrities. Including tennis ace, Pat Cash and the Rolling Stones' Bill Wyman. A cheque for £975,000 was presented to the Malcolm Sargent Cancer Fund for Children, the result of a nation-wide collection by school children. In recent years, latterly through Becky Burns, Head Gardener until 2008, the gardens continued to be maintained to high standards and they flourished. Visitors were treated to glorious colour in the spring and summer months, classic autumn giving way to winter. In the Spring of 2008 a new Head Gardener, David Lewis, was appointed. David had previously worked with colleagues from Mind (the mental health charity) at the roof garden with Becky. In May 2008 he announced ambitious plans to replant the Tudor gardens in black and white to reflect the Biba era. Before the Tudor Gardens could be replanted, extensive work was undertaken to relay the waterproof membrane which lay beneath them. Unfortunately the Rainbow Room, which sits directly under that part of the gardens, had suffered damage because of the membrane failure. 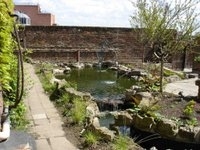 Once the membrane had been fixed the gardens were relaid and replanted. They were completed just before Easter 2009. The Spanish gardens too have received a facelift. The walls have been repainted in what David calls 'flamingo pink', taking his inspiration from samples of the original colours that were rediscovered. Four new palm trees were planted along with 5 olive trees, a pomegranate and a wonderful fig tree. The latter replacing a fig that Hancock himself had planted in the 1930's. In his online blog (2009) David said of the Spanish garden; "the whole effect is strikingly modern, and considering it was first designed in 1936 by Ralph Hancock it must have been quite startling to the visitors when the garden opened in 1938. The planting we have used is not the same as Hancock’s but we feel that we are being sympathetic to his planting and only using replacement plants that we think he would have used if they had been available to him." These two images below show the Spanish garden near completion. They are reproduced with the kind permission of David Lewis, Virgin Limited Edition. The gardens (left) replanted and with the walls repainted 'flamingo pink' near completion (March 2009) and (right) in February 2009 after very heavy snow falls that brought London to a standstill. The woodland garden has also seen some spectacular changes. Under David's supervision, a new lawn was laid along the river bank. Box hedging, like those originally laid out in the 1930's, mark it's border with the pathway along what was the old tea pavilion. Dean, a straight-talking Australian horticulturist and a colleague of David's from his time at Mind, said that the lawn was laid in just 3 days, well ahead of the 5 day schedule that he had been set. With colleagues from Mind and a team of labourers, the new lawn looks as if it has been there since Hancock's day. The Cotswold stone bridge (left), at the head of the river, has also been cleaned up and, apart from a minor alteration to it's path, made necessary with the installation of a lift (undertaken when Derry and Toms were still in operation), must look as it did when Hancock handed over the gardens to Trevor Bowen in 1938. Although long-gone, the waterfall (the remnants of which can still be seen in the brickwork on the far wall) has been replaced by this new water feature, which does not look out-of-place. The over-grown plants have all been cut back opening-up this long neglected part of the woodland garden. The images of the bridge, the new lawn and the water feature were taken on 1 May 2009. The video sharing website, YouTube, has a number of privately submitted videos that contain moving images of the gardens as they are now. This short video is one of the better examples.